Farah Mendlesohn and Edward James previously collaborated on the valuable and diverse Cambridge Companion to Science Fiction , an anthology that crammed a lot of insight into a relatively small book. A Short History of Fantasy is a different sort of book, a narrative of books and movies and paintings and computer games in which only a few titles or creators get more than a paragraph of mention. The goal here is to skim a large surface, not dive into particular depths. "Fantasy" is, after all, a slippery term with shimmery outlines; perhaps a wide-angle view will show more than can be seen up close. Thirty-two pages at the end of the book are taken up with a chronology that lists various writings from Gilgamesh to Beth Bernobich's forthcoming debut novel Passion Play , then continues with a list of movies and TV shows, artists, editors, and magazines and anthology series. This is followed by a glossary, a bibliography of critical works, and two indexes: one of titles and one of authors and topics. A reader seeking to find more books like the books they like thus has multiple tools at hand, though the index is probably the most useful, since the chronology offers no explanation for its choices. Why, for instance, does a history that proclaims in its final chapter to end in 2008 include nine books from 2009 and a debut novel from 2010? (Greer Gilman's 2009 Cloud & Ashes is at least discussed in the text itself.) Why are three Shakespeare plays ( A Midsummer Night's Dream , Macbeth , and The Winter's Tale ) included, but not others (such as The Tempest , which is actually one of the more interesting of the plays to discuss in terms of its use of fantasy)? Similarly, the two stories by Nathaniel Hawthorne ("Rapaccini's Daughter" and "Feathertop") are each name-checked in the text, but this doesn't explain why Hawthorne's "Young Goodman Brown"—a story frequently acknowledged by scholars and writers as important to the history of the American fantastic tale—is not included in a chronology that includes plenty of works deemed (without explanation) "important" but not mentioned in the text itself. Why becomes a central question when reading A Short History of Fantasy . The idea of a "short history" of one of the most common elements of human literature (written and oral) is absurd in and of itself, and even with the various limitations the authors have chosen (mostly Anglo-American texts, mostly 20th century, mostly works unquestionably accepted within the community of readers and writers comfortable with and devoted to the marketing category of "fantasy fiction"), much selectivity has had to be imposed, and few works are discussed beyond the length of three or four sentences. Part of the fun of reader's guides—aside from discovering unfamiliar items—lies in having one's own taste confirmed (somebody else likes Greer Gilman! Hooray!) and in arguing with the selection (what, no mention of the progression of Delany's Return to Nevèrÿon series beyond the first book?!). These are useful tasks, too, because they help us to understand our own taste and values more fully. Essential to understanding our own taste and values in comparison to the taste and values of the guide, though, is information about the selection, and that is where A Short History of Fantasy fails most frequently. Mendlesohn and James seem to be trying for a generally objective and descriptive pose, but their evaluative inclinations rear up again and again. Despite the presence of Franco Moretti's Graphs, Maps, and Trees in the bibliography, this is not a quantitative literary history, though it's obvious that Mendlesohn and James have not read all of the works they're attempting to chronicle (at least Moretti admits this element of his approach). There are no graphs or maps here, though there are some trees mistaken for forests. What defines "dross", though, is left for us to guess, as is the difference between the fiction mentioned in the text and the "important fiction" dumped in the chronology. Throughout the entire book, it is always difficult and often impossible to understand the evaluative criteria motivating the selection. More often than not, the apparent reason for including certain works and not others is one of Mendlesohn and James's perception of the text's influence, or, when the work has not been particularly influential, its status as neglected because of power structures within a particular discourse community or within more general society as a whole. This is a perfectly reasonable method of selection, and one common to literary histories . But Mendlesohn and James are willing to violate this method when a particular writer, for instance, doesn't write fiction that they appreciate. The authors then go on to mention that Call of Cthulhu was a popular role-playing game, but make no mention of the many films based on Lovecraft's work, though they are happy to discuss other films throughout the book. The mention of Derleth hides from the uninformed reader any knowledge of one of the most important small presses in the history of fantasy literature, Arkham House, founded specifically to put Lovecraft's stories between covers, though its mission quickly broadened. And there is no acknowledgement of the influence of Lovecraft on writers mentioned elsewhere in the book, including Stephen King, Joyce Carol Oates, and Peter Straub (the latter two of whom have edited collections of Lovecraft's fiction, but I suppose Mendlesohn and James think they did so while holding their noses). It might be excusable to devote only a paragraph to Lovecraft if the book scrupulously avoided horror fiction. But though Mendlesohn and James show little taste for or knowledge of horror fiction, they nonetheless include peripheral discussions of its supernatual texts throughout the book, and spend quite a few pages at the end on the New Weird, which drew from the history and traditions of horror. I balk at such a casual dismissal of Lovecraft's work not for aesthetic reasons, but because the dismissal makes clear the problem with downplaying the evaluative engine behind A Short History of Fantasy . There's nothing wrong with finding Lovecraft's work not to your taste; but to dismiss—indeed, to elide—his importance because his work is not to your taste is disingenuous. If you cut through the clauses there, you will see the illogic. We have an evaluative assertion that the Discworld books have maintained a high quality. The reason for that quality is eventually given: "Pratchett has used the storylines and characters to poke and prod at the 'givens' of our own world, of the stories we tell about it, and of the fantasy worlds many of his colleagues write." But that doesn't actually answer the question of why the books have "gone from strength to strength"—it simply tells us that Mendlesohn and James like the Discworld books because they include stuff Mendlesohn and James like in such books. A descriptive criterion—the Discworld stories satirize elements of consensual reality and textual fantasy—is offered as an evaluative criterion. I'm sure there are satirical fantasies that Mendlesohn and James consider inferior to the Discworld novels, but we have no way to understand why. Repeatedly throughout A Short History of Fantasy , the statements before and after the word "because" do not logically connect. Sometimes the explanations of evaluation are not so much illogical as ridiculous. Mendlesohn and James say the film The Adventures of Baron Munchausen "is arguably one of the best fantasy movies ever made, because the movie feels as if it loves fantasy" (p. 135). Using such a criterion, most fan fiction would count as among the greatest stories ever written. I entirely agree that The Adventures of Baron Munchausen is a wonderful film, but my agreement is based on my appreciation of the film's rich mise-en-scéne, its vividly imagined sequences, its wit, its willingness to be utterly excessive, etc. I have yet to perceive it as wanting to give an abstraction called "fantasy" a big wet smooch. Mendlesohn and James also display a clear commitment to an honest view of the effects of certain types of institutional and systemic bias within the community of writers and readers of genre fantasy fiction, especially in terms of gender, sexuality, and race. Some people might see such a commitment as "political correctness", but it seems to me more a willingness to be clear eyed about the social forces affecting the production and reception of texts through the years and centuries. There is no space in A Short History of Fantasy for a real analysis of those social forces, but that's par for the course here, where there is little space for a real analysis of much of anything. With occasional exceptions, analysis is not what this book is interested in. The "history" of the title mostly refers to what stories and novels were published when, since almost all of the chapters have two primary concerns: to lay out a chronology and to place books and writers into categories . If you want holes for your pigeons, you'll find plenty here; if you want more than that, you'll need to seek out some of the works in the bibliography, or a book such as Helen Merrick's The Secret Feminist Cabal . 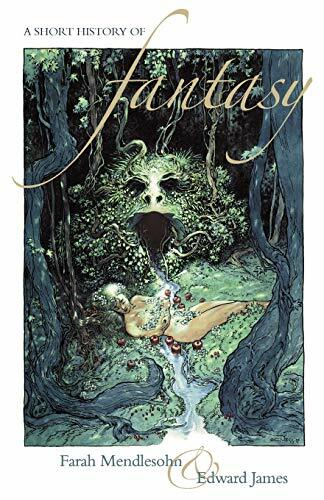 If you want to know that Mendlesohn and James think "dark fantasy" can be immersive fantasy, alternative world fiction, and rationalized fantasy, then you've got the right book. More broadly, if readers desire nothing more than some basic guidance toward some new writers and books to seek out, there is no reason they should pay attention to my criticisms here, because A Short History of Fantasy will serve that purpose just fine. There are, though, errors, and a few of them are serious. There are plenty of minor errors to keep nitpickers picking (Elias Canetti mistaken for Italo Calvino, the sentimental and melancholic stories of Theodore Sturgeon equated with the humorous stories of Fredric Brown, Sturgeon's "The Professor's Teddy Bear" renamed "Professor Teddy Bear"), but any book that tries to cover a lot of ground will inevitably have mistakes. Some of the errors are bizarre—where did the authors ever get the idea that Greer Gilman's Cloud & Ashes is "an entire novel using iambic pentameter" (p. 149)? That statement is wrong for two reasons: the novel's prose displays a marvelous variety of rhythms, and the "pentameter" part of "iambic pentameter" refers, of course, to the number of poetic feet in a line, and prose, by definition, is not broken up into poetic lines. It's true that a collection called Alyx was published by Gregg Press in 1976, and then The Adventures of Alyx in 1983 by Timescape, but the Alyx novel Picnic on Paradise , included in the collections, was first published as a book in 1968, and at least one of the Alyx short stories had appeared even before that. "My Dear Emily" was first published in The Magazine of Fantasy and Science Fiction in the July 1962 issue. True, it had to wait a while for Russ's preferred ending to be included, but even that had happened at least by 1983 when Arkham House published Russ's collection The Zanzibar Cat , and the story is powerful and surprising in either version. Attributing an important writer's early innovations to the wrong decade is a greater error than mistaking a densely poetic prose novel for a narrative poem. One such error is hardly an invalidation of the whole, but I've only highlighted a few errors that popped out to me without doing any research. The problem with such errors is that they cast doubt on the information I don't know off the top of my head, and a book with as vast a topic as this one has an awful lot of information in it, even with all the selectivity. The selectivity presents problems, too, but problems of a different sort from statements that are verifiably untrue. Selection is not only a form of evaluation, it is also a type of simplification—a necessary one, for no book can contain the world. Informed readers will be annoyed by different simplifications, and their annoyance will be based on how much they know and care about particular areas of discussion. I care, for instance, about theatre history and Shakespeare, so I immediately wrote a nasty comment in the margin when I read that "Shakespeare, an embarrassment to the Enlightenment, was now [19th century] valued for its 'medieval' qualities . . . " (p. 15)—a statement that profoundly misunderstands Shakespeare's reputation during the 18th century (when his plays were plenty popular, but not yet worshipped by Bardolators, and objections tended to be about his tragedies' unhappy endings and his failure to adhere to the neoclassical unities) and oversimplifies his appeal in the 19th century (which is tied, too, to the history of the development of stage design and technologies). Or, to choose a more recent example: the New Weird as described in this book will be hard to recognize for anyone who wasted far too much of their life watching that term get argued about online and at conventions during the previous decade. Ann and Jeff VanderMeer edited an entire anthology devoted to showing the complexities and paradoxes of the term, but few of those, or any, complexities and paradoxes are visible in A Short History of Fantasy , in which "The New Weird" is like a room in a zoo, a place where wildness is tagged and tamed and put on display. There isn't much room for wildness in this zoo of a book. Zoos are fine things for conserving last remnants of species and for helping audiences get a broad, simplified picture of the animal world. To keep themselves busy, a few particularly obsessive zookeepers can categorize and recategorize the creatures, like an old man puttering about in a garden. No harm, no harm. The little zoo that is A Short History of Fantasy of course doesn't have the scope of a giant metropolitan zoo like the Clute and Grant Encyclopedia of Fantasy , but no-one is pretending otherwise. Zoos have their place, I guess, so long as we don't mistake what we find there for animals in the wild.